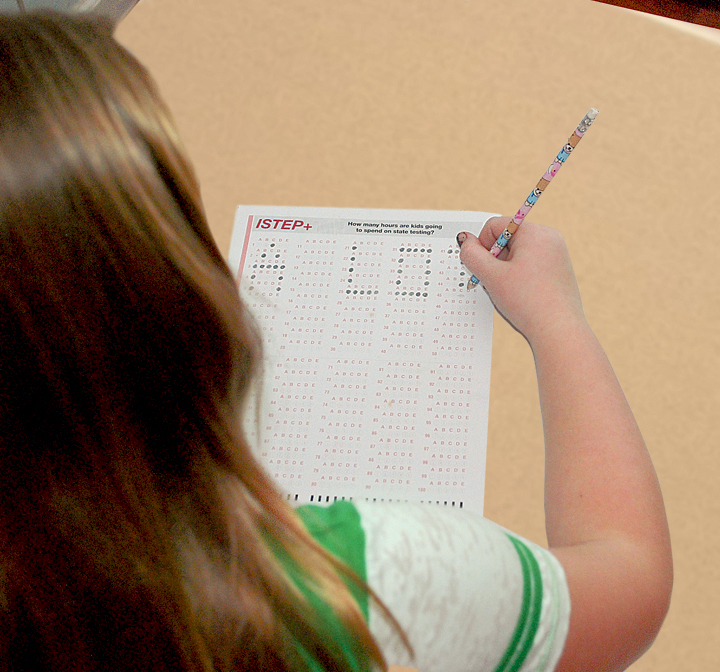 Indiana students may be seeing some major changes to their ISTEP+ tests this year, though they may not be filling in as many bubbles with heavy dark marks as initially planned. The 2015 ISTEP+ test, to be administered to over four hundred thousand students in grades three through eight, was originally expected to undergo changes that would’ve lengthened the exam by as much as seven hours, more than doubling its size from previous years. The lengthened test in part resulted from the Department of Education’s lack of a pilot test that would’ve sampled the validity of questions on a smaller subset of students before issuing it to the entire state. On Feb. 9, the DOE was taken to task by Gov. Mike Pence, who issued an executive order to cut the length of the exam back down to around six hours. In order to find ways to reduce test times, officials are in contact with nationally-recognized experts on assessments which, according to Pence’s statements, may include making the social studies and reading portions of the exam more concise. However, in spite of the executive order, final say on the length of the test still rests with state superintendent Glenda Ritz and the DOE. Hamilton Southeastern schools continue to prepare for the exam. “HSE is actively preparing the students for the ISTEP testing environment. We will wait further instruction from the DOE and Gov. Pence,” said Bev Smith, HSE director of school and community relations. According to Dana Altemeyer, coordinator of communications, marketing and PR for the Metropolitan School District of Lawrence, teachers and administrators have been concerned about the length of time our students are being asked to test. “The hours described by the Governor yesterday do not include the additional time (up to double) provided for students with special needs or those that are English language learners. There is also tremendous concern about the “eleventh hour” nature of this decision – tests are due to arrive in our district sometime between now and Friday. We have no idea how the Governor’s Executive Order will impact this test – how decisions will be made on what to cut, and what that will do to the reliability of the test results. While we were unhappy with the length of the test, plans had been put in place – those plans are no longer valid. With no current guidance from the Department of Education, all plans are on hold as we await further instruction. Of equal concern is the fact that there was no baseline pilot test administered, and that high stakes accountability will be based on a test that is not only very different, but one that is being used for the first time. We remain unsure of how student growth can be measured with two very different assessments. All of this places our students, teachers and administrators in a very stressful situation.